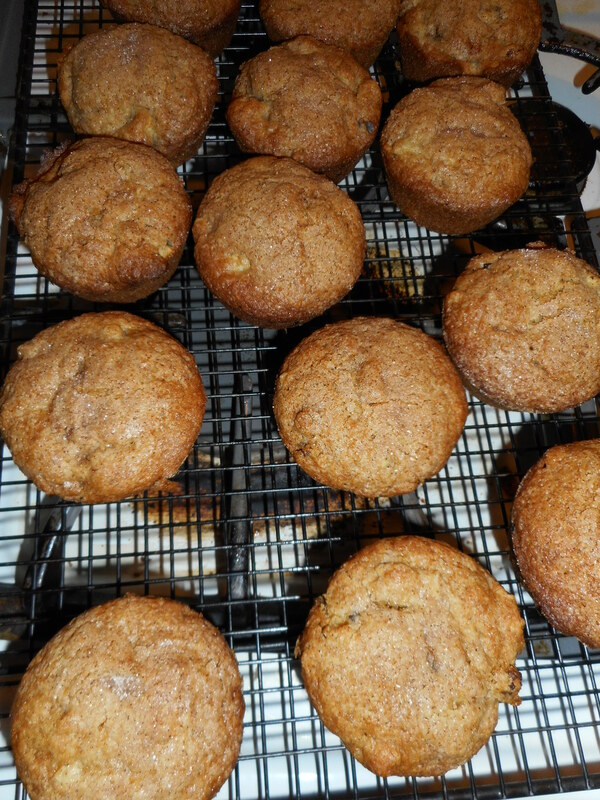 Apple Cinnamon Muffins…Oh so Cinnamony! 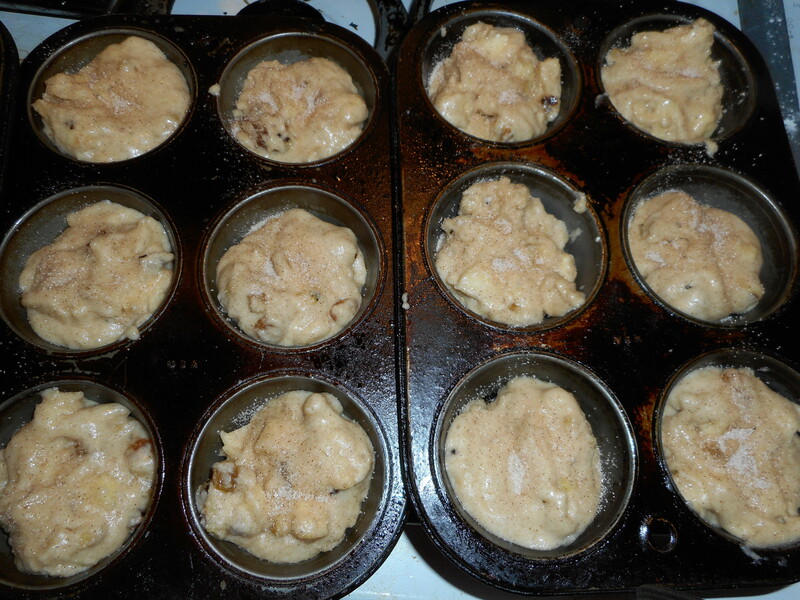 I had no portable baked snacks and a bowl of apples so I figured it was time for apple muffins. This is another great recipe out of Annalise Robert’s cookbook; Gluten-Free Baking Classics. It is very similar to her banana nut muffins. If I had to have just one GF cookbook hers would be the one for me. I use so many of her recipes and her quick breads are outstanding! 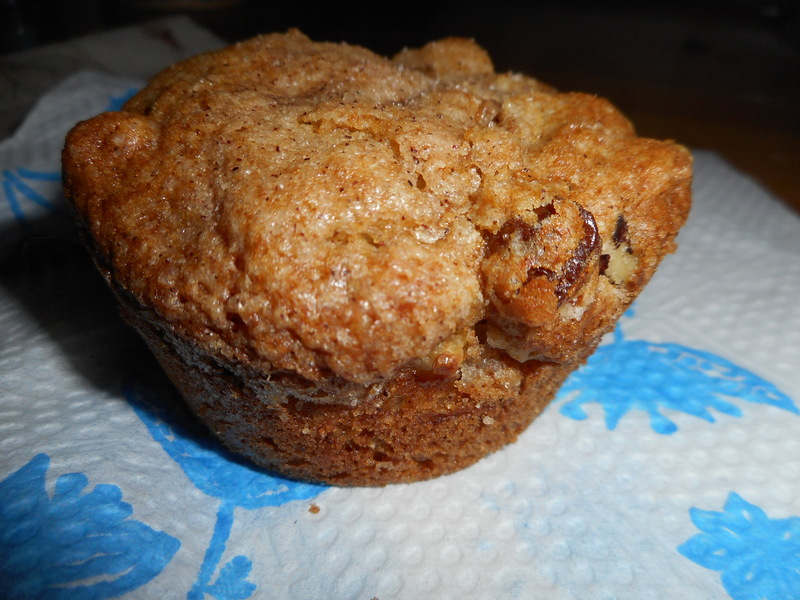 The apple cinnamon muffins did not disappoint: light, crunchy outside with a great cinnamon apple flavor. I put some golden raisins in my muffins but if you are not a fan; leave them out. They are my addition to this easy to make recipe. I also used half mexican cinnamon; a touch spicier than regular cinnamon but very good in these muffins. I ran out of cinnamon and was happy to have a close alternative to flavor these treats. Do use a baking apple; not red delicious which are solely an eating apple and don’t use a extra firm one like the tasty Granny Smith; they won’t get soft enough during the rapid baking of these tasty little treats. I got a half peck of mixed baking apples from Bechdolt’s Orchard a week ago and have used them in several recipes– not an apple yet that wasn’t fantastic in flavor and texture. I enjoyed eating a muffin still warm out of the oven. It is smart to freeze any you won’t eat in 2 days; ziplock freezer bag works great. They make super snacks. These apple muffins are kinda delicate; if you want to take them on a hike or car ride put them in a plastic food box – the rigid sides will keep your muffins safe from crushing. 1 c chopped apple; peel and core the apple! Heat oven to 375, placing the rack in middle of oven. Spray muffin pans with cooking spray. One batch makes 12-16 muffins. Combine milk and oil, remove 1 tbsp of combined liquid and ditch it. Beat in eggs. Add liquids to big bowl; stir until blended. Fill muffin pans 2/3 full. I use a big serving spoon and fill it about half way to dump in each muffin space. Sprinkle the top with cinnamon sugar. Bake 20-24 min until golden brown. Do not over bake or they will taste dry. Remove immediately from the pans and cool on a rack. Freezes well for up to 3 weeks. Keeps in fridge (well wrapped) a few days. French Apple Tart….Ooh La La! Tasty, crisp, ripe apples are pouring into the farmer’s markets and orchard stores right now. 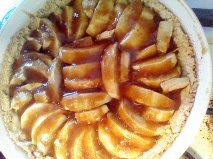 This French apple tart is an old favorite of mine, been making it for years. I once worked at an office where they would request it whenever we had an office function or party! I have no idea where I got the original recipe from so I can’t give credit for it, I lost my copy and had to replicate the measurements a number of years ago. Plus, I had to change it a bit in the last time or two to make it gluten free but it tastes just as good as before. The cinnamon and lemon topping are what makes it so delish. 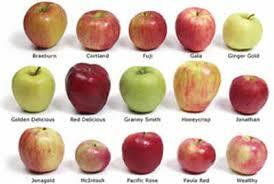 It should be made with an apple variety that keeps its shape; Granny Smith is the best choice in that regard. Don’t use one that goes all squishy like Empire or Macintosh. You only need 3 large apples. I use my GF tart shell crust which is from Annalise Roberts’ great cookbook; Gluten-Free Baking Classics. It is very easy; hand pressed into your tart pan. I would say that this is a cookie crust; sweet and short; very yummy. It should give you about 6-8 slices of tart. Lesser amount of slices if your family is piggy, the full eight slices if they are not big dessert eaters. I rarely have any of this tart left over for more than 24 hours. It is very popular with everyone. I like it for how easy it is to make, how handsome it looks and that I can throw it together quickly with only 3 apples and a lemon. 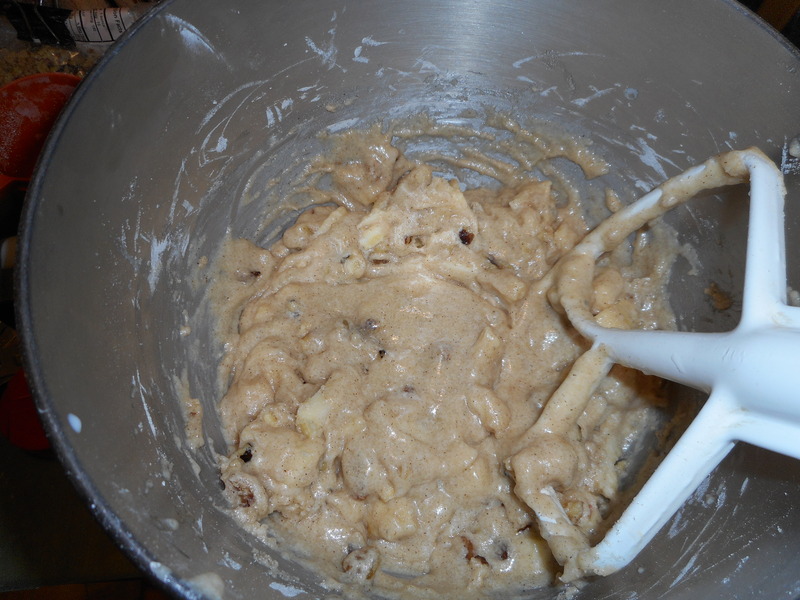 Mix the dry ingredients in a stand mixer, cut in the butter by mixing it at a med low speed until crumbly. Add vanilla and mix well. If it is really dry looking add a tbsp. of water. Press into the bottom and up the sides of your tart shell as evenly as you can make it. For this recipe I use a large 10 inch tart pan. Mine is ceramic so it doesn’t have a removable bottom. Bake it at 350 degrees for 10 minutes. Lay the apple slices in concentric circles in the tart pan over the crust. Put them really close to each other so there isn’t a lot of space without apples on it. Mix the sugar and flour and sprinkle over the apples. Cover loosely with foil and bake 25-30 minutes until the apples are soft if pricked with a fork. Do not bake until they collapse; the slices should still hold their shape. While the tart is finishing up its baking time make the topping. 2 tbsp. sugar and 1 tbsp. cornstarch and mix them. Cook over medium heat, stirring it constantly with a small whisk or a spoon, until it boils and seems thickened and is no longer opaque. This should take less then five minutes. Remove from heat and pour the hot gloppy topping carefully over the hot apple tart taking your time so you cover the entire surface of the apples. If you like lots of cinnamon you could increase that up to a tsp. of cinnamon in the filling. Let cool to at least lukewarm before serving. This tart is perfect with a scoop of vanilla ice cream on the side. Don’t put it on top or it will not look so nice because of the French cinnamon topping won’t like to share its space with the chilly ice cream!